Whether you are shopping for a home, thinking about selling your home or just looking for a schedule of upcoming events in 828, we hope this site proves useful to you. It was created to help showcase the wonderful world of Asheville and its surrounding areas, while being a great resource for people looking to purchase or sell real estate in Western North Carolina. 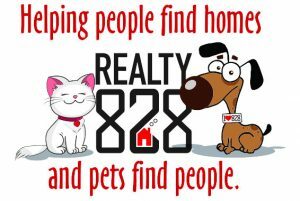 REALTY 828 is also passionate about helping animals find homes. We are a strong supporter of animal rescue. We give donations to local pet rescue organizations throughout the year.